New high-definition plasma cutting technology has been introduced by the T.W. Woods Group to optimise efficiency and quality in the production of chutes, bins, loaders, tanks, silos and other materials handling and metal fabrication tasks involved in creating long-life, low maintenance products. 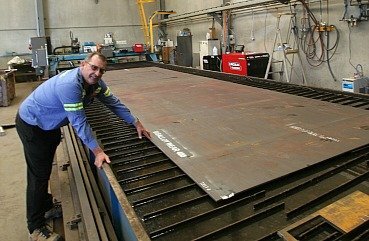 The new Lincoln Spirit 400 machine – now operating in the company’s 400 sq m plate processing facility – was specified to deliver industry-best standards of cut quality on standard and specialty steels, including stainless steels and heavy duty chromium carbide protective plates up to 60mm thick. TW Woods Managing Director Tom Woods says high quality wear and Impact-resistant materials are now in high demand as coal and mineral processing plants place new emphasis on long-life product that avoids delays and breakdowns as mines step up production. The same quality, traceability and accountability standards are being required by private and State organisations involved in the energy, marine, oil and gas, water and waste water and defence sectors, where safety and durability are paramount. The investment in state-of-the-art plasma cutting technology has also been complemented by the installation of a new 6x15m, 5m high Truflow spray booth and bake oven to deliver best quality protective finishes for customers in industries including defence, energy, manufacturing, mining, minerals processing, materials handling, metals, process engineering, water and waste water. Truflow technology – the same type used by industry leaders including Siemens, Bombardier and Veolia – is used by T.W. Woods to apply quality finishes ranging from camouflage patterns for defence projects, to protective coatings for mining, energy and bulk handling equipment used in aggressive, marine, chemical and mining environments. The investment in state-of-the-art plasma cutting technology has also been complemented by the installation of a new 6x15m, 5m high Truflow spray booth and bake oven to deliver best quality protective finishes for customers in industries including defence, energy, manufacturing, mining, minerals processing, materials handling, metals, process engineering and water and waste water. “The optimised work flow and range of production facilities available on the one site means that even the most complex jobs can be handled efficiently and expeditiously, without elements of the work having to be sent off-site with the attendant delays and potential lack of uniformity of quality standards,” says Mr Woods. Materials handling system efficiencies are further enhanced by innovative designs from T.W. Woods partner engineering group Chute Technology, which uses advanced engineering technologies, including Discrete Element Modelling, to optimise and translate into reality materials handling configurations that minimise problems such as impact and abrasion zones and which smooth the flow of material within such systems. 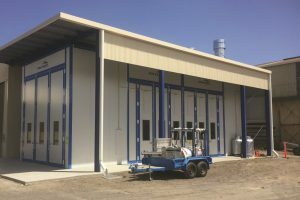 Housed on the company’s two-hectare site with Hunter River frontage, the new facilities complement 4,000 sq m of workshop area in which the company undertakes medium to heavy steel fabrication, plate rolling and pressing and manufacturing of materials handling equipment including chromium carbide clad plate hardened steel products. The company’s services (including specialised shaping, fabrication and welding technology for metals including carbon steel, stainless steel and aluminium) are used by organisations such as Delta Energy, Incitec Pivot, water and waste water authorities, Integra Coal, Laing O’Rourke, Xstrata and surface and underground mining companies throughout Australia including iron ore producers in the Pilbara and coal companies in Queensland. The company has also become a valued supplier to the water treatment and materials handling industry because of its expanded capacity to process specialised metals and manufacture complex shapes required for special-purpose tanks, silos and pressure vessels.